I was trying to explain to someone why a recent theatre piece we saw didn't really work as a comedy. Yes, it was meant to be funny but despite a few giggles, groans and that odd blowing sound people make, like a strangled sigh, the work didn't really get any honest belly laughs. Why? I had to consider the material for a while until I could pin-point the issue. It was chocked full of local and pop cultural references. Sometimes an audience will acknowledge 'familiarity' with a laugh and sometimes they won't. I think the proof is in the pudding. The what? Well, what I mean is - if you lay something right out in the open on the surface, something familiar to people, of course they will get it. But is that funny? Well, no. However, if you make them work a little for it, think about it, dig into the pudding to uncover it, the laugh will be there. Let me explain further. OK. Maybe stand up comedians simply use material that we all can relate to. Our acknowledgment or more specifically, our recognition of it, can make us laugh. We hear something within the joke that we identify with - "Oh I have done that!" etc.. Example: George Carlin was infamous for pointing out simple things we could relate to- such as a simple statement like: "Have you ever been wearing a hat for a while and then you take it off, but it feels like the hat is still on your head?" Or "Have you ever noticed that anybody driving slower than you is an idiot, and anyone going faster than you is a maniac?" - In essence, these are very simple observations that most of us can relate to and admit - "Yes! I have done that!" But as simple as these observations are - each takes a moment to think about, we have to dig down a little further and uncover a memory of "wearing a hat" or calling someone an "idiot" while we were driving. Note: we had to think. We need to call up a mental image of ourselves or maybe someone else, and when we find a memory that allows us to recognize the image - we laugh. Why do we laugh? Well, maybe because we realize we are not the only one who "thought" about it. Wow! A whole room full of people have felt the phantom hat! Now, if you merely sprinkle your dialogue with blanket references, such as mentioning a popular game show, or presidential candidate or local radio jingle, sure the audience may "relate" and/or "recognize" it but their "thinking" doesn't have to go very deep. It's nothing very personal, it's merely a recollection. Here's another example of a cultural reference that I saw just recently in the film "Rango". Near the beginning of the movie, there is a traffic accident in which the chameleon, played by Johnny Depp is tossed through the air on a desert highway and for an instant, lands against the windshield of a car driven a character who appears to be Hunter S. Thompson. Why is that funny? 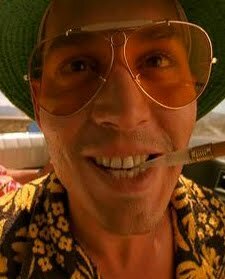 Well, anyone who has read "Fear and Loathing In Las Vegas" will be familiar with the beginning passage where the character "Raoul Duke" is having vivid hallucinations as he drives through the desert. OK that's one level. Let's dig down in the pudding further - the film version of "Fear and Loathing in Las Vegas" had Johnny Depp starring as the character Raoul Duke. So, in essence we have a Johnny Depp character interacting with... yes, you guessed it, a Johnny Depp character. This very quick visual reference or joke works on two levels, but you had to processes a bit of mental thought and recognition to get it. The bottom line is the reference will be funny if your audience has to think for a moment or to actually work to "get it". That is why the theatre piece we saw didn't invoke much laughter. Having one character say, "Wow, she's a real Sarah Palin" - doesn't do much. Just saying the name Sarah Palin isn't really funny. Maybe if the line were, "Wow, she would make a great Governor of Alaska!" - could work better. We would have to think and provide the reference for ourselves - in other words, do the work to make the joke. So, simply throwing out references on the surface your dialogue, on top of your pudding, will lay there somewhat flat. Give the audience some spoons.